Is the Monmouth Plantation haunted? 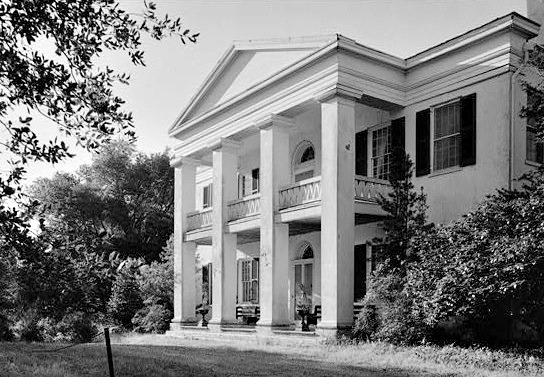 The Monmouth plantation was built by a man named John Hankinson, who was a steamboat entrepreneur, a lawyer and a postmaster. Constructed on a 26 acres lot, John had a lucky break with his money following the depression in the economy after the war of 1812 and decided to build a sizable house named after his home town which was Monmouth county in New Jersey. The building is a federal style 2 story brick building with a large hallway and 8 rooms and a detached kitchen, as well as a few other garden buildings. John quickly had financial trouble however and the house was sold at public auction in 1825. After this the house was sold quite a number of times throughout the years and had a number of renovations and expansions. The house today is a privately owned residential property. There is thought to be only one ghost at the plantation, and his name is General John A Quitman. He was the first person to buy the house after the the original owner and builder and moved in here with his wife and quickly growing family. John Quitman was one of the people who approached Wahington D.C. and made the case for letting the south leave the United States. He died in the property on July 17, 1858, and it is widely believed he was poisoned. It seems the General wasnt quite ready to leave the house he shared with his family, even though he took a break before coming back. There were no signs of a haunting here until in 1977 when the property was bought by Lani and Ron Riches who began substantial renovations on the house which had fallen into a bad state. Ever since the work began people have seen and heard the spirit of General John Quitman. During the restoration workers claimed to feel a very uncomfortable feeling as if someone were standing right behind staring at them. This has become a common thing at the house, as has the sounds of heavy stomping footsteps. The General's apparition has been seen dressed in pre civil War military uniform and he seems to enjoy marching along the corridors and into rooms. Many people who have visited the mansion including the police have all heard the heavy stomping sounds coming from the upper floors and the attic with no identifiable source. The General has also been seen peering over guests, as one who stayed in room 30 once claimed to awake to the General standing over their bed looking down on them, as if to check if everything is in order, before disappearing into nothing.